Welcome to the very first blog from the Modern Renaissance Man. I thought I should start things off with a bit of a "tip of the hat" to the History behind some of the Classic Men's Accessories companies. Hickok: S. Rae Hickok, founded in 1909 by buying a small jewelry plating business for $350. He led the company's expansion as a major manufacturer of wallets, belts, pants, suspenders, cuff links, tie clasps and other men's accessories. Mr. Hickok also developed prototypes of safety seat belts, which ultimately became standard automobile equipment and are credited with saving many lives. Because of his own early struggles as a business official, Mr. Hickok decided to help other fledgling executives by founding the Young Presidents Organization, which drew thousands of members worldwide. He was also a co-founder and honorary chairman of the World Presidents Organzation and a leader of the Young Entrepreneurs Organization. Swank: Swank, Inc. was started in 1897 in Attleboro, MA as the Attleboro Manufacturing Co., and specialized in making and selling women’s jewelry. Not long after the start of production of women’s jewelry, however, a massive fire destroyed the factory as well as an entire city block of Attleboro. Some jewelry as well as some machinery was saved and the company moved its manufacturing to a nearby building, which remained the center of the company’s business for the next 100 years. When the United States joined WWI, the company contributed by making metal dog tags for soldiers, as well as other emblems for the military. Around this time, the men’s jewelry line had really taken off, so the women’s jewelry lines were discontinued. The company then focused all of their attention on producing men’s accessories like tie clips, pins, collar buttons and dress sets. The name Swank was used in one of the company advertisements as early as 1927, but the company did not form Swank Products, Inc. until 1936. In 1941, the company shortened the name again and they became what we now know as Swank, Inc.
Krementz: Collectors prize Krementz jewelry pieces for their beauty and for the incredible quality the company put into creating costume jewelry. The Krementz jewelry story began in the 1860’s, when George Krementz founded his company in Newark, New Jersey. Their original intent was to create men’s jewelry, such as collar buttons and cuff links. In 1886, they turned to the use of gold overlay to create their jewelry. They used rolled gold plate to create a high quality jewelry that was, although technically costume jewelry, by no means cheap. 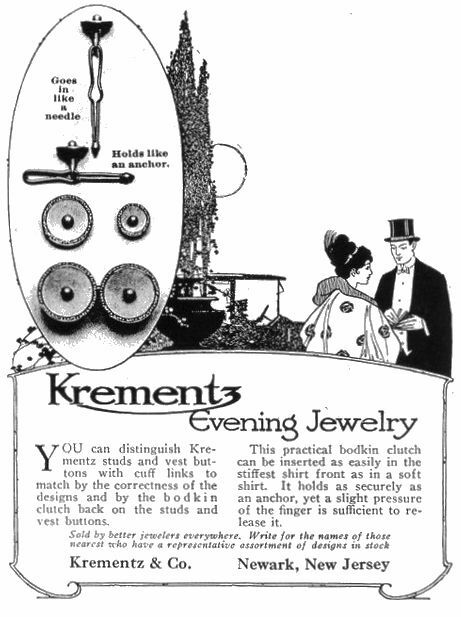 According to Krementz jewelry advertisements of the time, they used gold 30 times as thick as that used in the production of most costume jewelry. The intention was to create a high quality line of jewelry to be sold in department stores. By the 1930’s Krementz jewelry is being sold internationally. A salesman would take a yearly trip to many exotic destinations to sell the jewelry in countries such as India. Anson: Olaf Anderson emigrated to the U.S.A. from Sweden in 1929 and founded, as president and treasurer, in 1938, the Anderson Tool & Die Co. of Providence, RI making tools and dies for the jewelry manufacturing business up until WWII (1941) when the machinery was converted into milling machines making war production work. 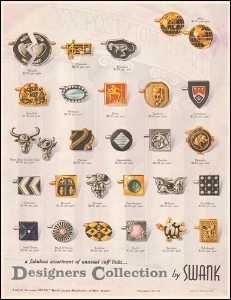 After the war, in 1945, when the war contracts were completed, the company started manufacturing men’s jewelry that included a new type of a collar holder and a complete line of men’s jewelry, cuff links, identification bracelets, tie clips, stick pins, tie tacks, tie chains, collar holders, key devices and money clips comprised of sterling silver, gold and silver filled metal bases. The company changed its name in 1948 to Anson Inc. In 1967, along with the men’s jewelry lines, women’s jewelry of stick pins, brooches/pins and silver beads were added to the manufacturing output that used rhodium, bronze and pewter along with the sterling silver, gold and silver filled base metals. The Tiffany Company sold Anson jewelry in their department stores.